The Beatles 50 Years Ago Today: November 8, 1968. Beatles Radio: The Beatles, Solos, Covers, Birthdays, News The Fab 4 and More! 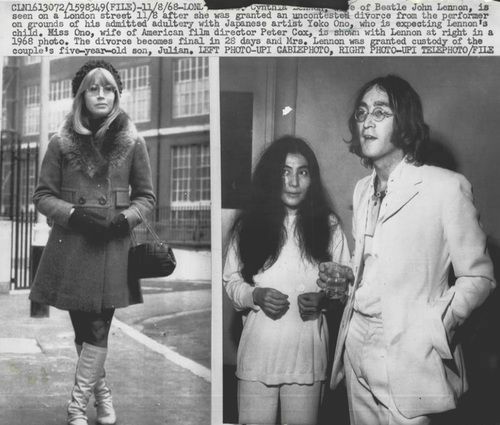 Cynthia Lennon was granted a divorce in the London Divorce Court, ending her marriage to John Lennon. The reason given for the action was Lennon's adultery with Yoko Ono. Cynthia was also granted permission to retain custody of Julian, her son with John. Here is what Cynthia said: "Our decree nisi was granted on November 8, 1968. I was summoned to the divorce court and went alone, driven their by loyal Les Anthony who, although he was now working solely for John, was still a good friend to me. Walking into court beside my lawyer was terrifying. The place was packed with the press and I had to swear in front of them under oath that my marriage had broken down irretrievably, that my husband had publicly admitted adultery and that Yoko was pregnant by him. Throughout this awful, surreal experience I felt humiliated and painfully aware that I was alone. Afterward I fled home and collapsed, sick with apprehension about the future. I had no idea how I would cope and still found it hard to believe that, after ten years together, I had been severed from John's life with a few brief words from a judge in a public court. I should have hated John for what he had put me through. I was certainly angry with him and bitterly hurt. But I couldn't hate him. Despite everything, I loved him still." During the case John Lennon submitted assets worth £750,000, although this was likely to have been an low estimate. From this he offered Cynthia £100,000, raised from an initial offer of £75,000. Of the £100,000, £25,000 was to be allocated to a house for Cynthia and Julian, and the remainder was to support the pair until Julian turned 21. A further £100,000 was put into a trust fund for Julian. Cynthia was permitted to make withdrawals from the fund for school fees, subject to approval from Lennon and Ono. It was also agreed that, should John have more children, the fund would be shared equally among them.